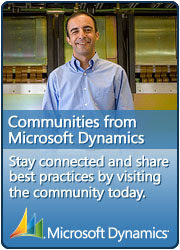 Welcome to my blog of Dynamics AX. In this blog I want to share my own ideas and experience with various topics in the Dynamics AX world, all from coding business logic in Dynamics AX, to developing web interfaces in Enterprise Portal and also Business Intelligence activities like building Analysis data and reports through Reporting Services. I just hope I get the time to write as much as possible. If anyone finds this blog before I get the design properly configured (using Blogger), please be patient while I choose fonts and colors (and whatever options available).